We start off Smackdown with a sweet video package about what happened on RAW between Rock and Punk. Seeing as that video package was prepared within one day for the Tuesday Smackdown, I think it’s safe to say that the guys who make the WWE video packages are the most time efficient guys in the freaking world. We cut to the arena where Team Hell No makes their way to the ring. We get a little video package of Kane and Bryan’s anger management graduation from RAW. Kane and Bryan start disputing that they’ve gone soft, and say that they will prove their dominance at the Royal Rumble, and then the two argue over which one of them is going to win the Royal Rumble. After a few seconds of bickering, the Big Show‘s music hits and he slowly makes his way down to the ring. He picks up the mic and says that he has a 100% chance of winning his title back. Since he’s not talking about winning the Royal Rumble, I have no reason why the hell he would interrupt Team Hell No. He says that he’s going to squash Team Hell No like he’s going to squash Alberto Del Rio. Team Hell No disagrees, and Team Rhodes Scholars make their way to the ring. All we need is Alberto Del Rio, and we have our tag team match main event ready for the making. The Rhodes Scholars (you guessed it) say they are going to defeat Team Hell No at the Royal Rumble for the tag team championships, and they offer an alliance to the Big Show. There’s Del Rio! Now we’re just waiting for Booker T’s music to hit so he can make the tag match for tonight. And there it is! Teddy Long should sue Booker for gimmick infringement. 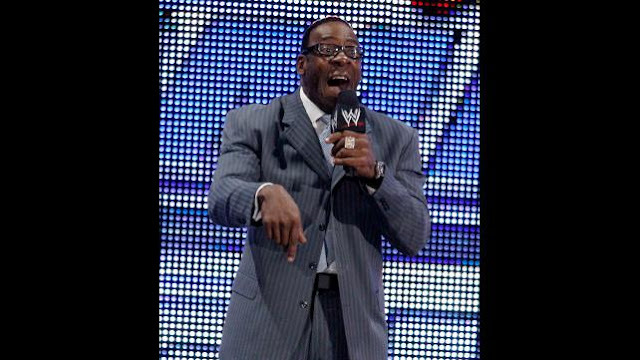 Booker T does the same thing he does every week where he comes from the back with a mic going “Whoa! Whoa!” and then makes the super obvious 6-man tag team match main event of Del Rio and Team Hell No vs. Big Show and Rhodes Scholars. Booker T also announces that it will be an elimination tag team match, which is a nice change of pace from the usual. Kind of like a Traditional Survivor Series match in WWE ’13. The faces fend off the bad guys and stand in the ring as the edited-in crowd go absolutely crazy. JBL and Josh Matthews announce that both Punk and Rock will be on SmackDown to address what happened on RAW with the Shield, and that when we come back from commercial, Sheamus and Wade Barrett will be in action. I’m not trying to complain, because Sheamus vs. Wade Barrett have great chemistry, but WWE has a habit of doing the same match over and over again for an extended period of time. Last week, we had Orton vs. Cesaro on Main Event, Smackdown and RAW, and it kind of got boring after a while. They’ve done that with Sheamus and Barrett quite a few times too. We come back from commercial to see Sheamus make his way down to the ring with Barrett following. Side note, it’s pretty surprising to see Wade Barrett come out last. Usually they would give him the jobber entrance with a guy like Sheamus, but they rightfully made him come out last. The champion (whether it’s a title match or not) should always come out last. The two brawlers start trading strikes, and Barrett hits a dropkick, a move I’m not sure I’ve ever seen Wade execute before. Sheamus quickly goes for the Brogue Kick, but Wade Barrett smartly ducks out of the ring. Sheamus goes for the Irish Clubs on Barrett, but Barrett reverses and sends Sheamus tumbling to the floor with a huge Big Boots as we go to commercial. What did you think was going to happen, Sheamus? We come back from the break with Barrett once again sending Sheamus to the floor outside the ring, this time with a huge clothesline. Sheamus comes back with a springboard shoulder block, and starts to hulking up. After hitting the ten Irish Clubs on Barrett, he executes the rolling fireman’s carry for a two count. He goes for the Irish Curse back-breaker, but is met with a huge Superkick to the gut from Barrett. Sheamus goes for a roll-up, and hits Wade with the Irish Curse after he kicked out. Sheamus sets up Wade for the White Noise, but Barrett throws him to the apron. Sheamus tries to go to the top rope, but Wade throws him off the top and hits him with another huge Superkick for the two count. With Barrett, Rollins, and the Usos all using the Superkick, it’s a little weird to see Ziggler use it as a finisher, as it never manages to finish the match for anyone else. Well, I guess Ziggler can never finish a match with it either, but still. After Sheamus hits the White Noise on Barrett, he plants him with a Brogue Kick for the three count. Great match. Not surprising since both men have amazing chemistry with one another. I’m just waiting for the two men to actually FEUD. Hopefully for the World Heavyweight Championship. Why this man hasn’t been World Champion yet is beyond me. We return from the RAW Re-Cap with the Great Khali, Natalya, and Hornswoggle. I’m only happy to see one of these people. Natalya enters the ring for some Divas action against Rosa Mendes, a person I wan’t even aware was a wrestler. Natalya starts off the match with some one-sided technical wrestling as Khali, Hornswoggle, Primo, and Epico join the commentary booth. Khali says that after he wins the Royal Rumble, he will and everyone else will dance. I can assure you Khali that if you were to win the Rumble, you would be the only one dancing. We would all be crying. Rosa starts belly dancing in the ring, causing Hornswoggle to start belly dancing on the table too, distracting Rosa long enough for Natalya to catch her in the Sharpshooter for the win. Nice to see Natalya in the ring, but it would be better if was under different circumstances. Going against Rosa Mendes while being cheered on by Swoggle and Khali isn’t something to brag about. We return from the break as “Cult of Personality” hits and the WWE Champion CM Punk makes his way down to the ring. I love how heel CM Punk wears a hood to make himself look more evil. The little things folks, the little things. I wonder how much muscle mass Heyman has gained from holding the WWE Championship belt like that for all these months. That thing weighs like 30 pounds. CM Punk picks up the mic and says that he is afraid. Not of the Rock, but of the fact that he can lose his championship because of the Shield’s interference. As most of you already know, Mr. McMahon stated on RAW that if the Shield gets involved in Punk’s title match at the Rumble, Punk will be stripped of the title. Just remembered this when the camera zoomed in on the title, but wasn’t a new title design supposed to happen? I know they were working on it, but it’s starting to look like the whole redesign has been scrapped. What a shame, the current design looks like Flava Flav’s poop. Punk calls out the Shield to confront them face to face, and the Shield’s music hits immediately. Fun Fact: Roman Reigns is cousins with the Rock. The three upstarts make their way through the crowd and surround CM Punk on the ring apron, Nexus style. CM Punk starts to talk to them as they stand on the apron as he wields a chair for protection. He tells them to stay out of his way at the Rumble, and says that he lost the title because of them it would be an injustice, something they are trying to fight. He once again states that he doesn’t want or need their help, and says that if they stand for truly stand for justice, they’ll never have to cross paths again. The Shield get off of the apron and make their way out of the ring, and leave Punk alone in the ring. Punk puts over himself for his match with Rock at Rumble, gets some cheap heat from the crowd, and starts to yell that he is the greatest of all time. Cue the Rock. 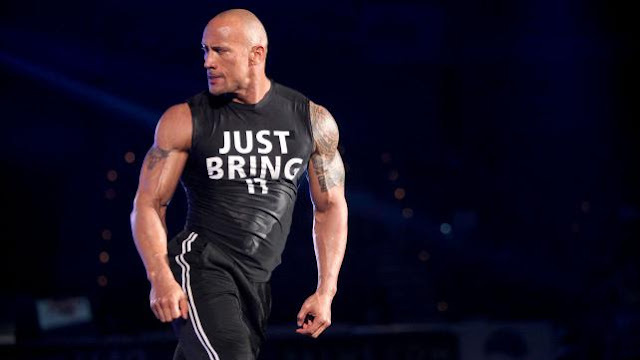 The Rock makes his way down to the ring for his last in-ring confrontation with Punk before his title match at Rumble, and two stare some intense looks. Apparently internal bleeding doesn’t take that long to recover from. Punk flashes his Championship title at Rock, and Rock begins what I assume will be a pretty formulaic promo. Rock accuses Punk of being a liar and says that he is working with the Shield. Rock says (for the 100th time) that he will end CM Punk’s title reign at the Rumble. He ends his promo with his catchphrase and throws the mic away, not letting CM Punk a chance to rebuttal I wish he would have, as I think they would have really hit it home if CM Punk got some words in that, but it was still effective. Josh Matthews says that Orton will be competing next, and since he didn’t say who he was facing, I’m going to assume it’s someone from 3MB. I was right. It’s Drew McIntyre. Randy Orton makes his way down to the ring for his match against the former Chosen One, and I wouldn’t expect this to last more than three minutes, let alone two. Drew McIntyre takes control early, but is hit with Orton’s 5 moves of doom. Mahal runs into the ring, causing a DQ. Orton hits Jinder with the RKO, then Slater with the RKO, and last but not least, hits D-Mac with an RKO. I think it’s safe to say that 3MB won’t be winning the Rumble. And just like that, 3MB are no longer the favorites to win the Rumble. We come back from the break with Miz making his way down to the ring for a match with Darren Young (Really?). Cesaro, who will be facing Miz in the Rumble pre-show, is on commentary with JBL and Josh. Miz pretty much dominates Darren Young, hitting all of his signature moves. He goes for a Skull Crushing Finale, but Darren Young gets out of it, only to be caught with a Figure-Four, getting Miz the win. Miz and Cesaro trade some stares as the US Champ waves the American Flag. We get a re-cap of Rock and Punk’s promo from 3 minutes ago, because WWE thinks we have extremely short term memory. After a slick Royal Rumble fun facts video package, it’s time to start our main event. It kind of bugs me that Del Rio has the big Mexican Flag as his titantron video. I hate patriotism. The newly car-less Del Rio makes his way to the ring as we go to commercial. We return from the break in the midst of Team Hell No’s entrance, which irks me a little bits since champions should NEVER get a jobber entrance. Rhodes Scholars and Big Show make their way to the ring and the match commences. Del Rio and Rhodes start the match off with some great chain wrestling. Del Rio hits a beautiful Tope Atomico, and what I believe was an inverted back brody drop. Whether you like face Del Rio or not, you can’t deny that it has brought out some great luchador skill out of the World Champion. Sandow and Kane are the next pair to duke out in the ring, and Sandow is immediately eliminated by Kane after a big Chokeslam. Big Show enters, and the two big men who have infamously bad matches with each other clash. Big Show hits the KO Punch on Kane on the outside, and Kane gets eliminated via Count-Out as we go to break. He can summon fire, but he can’t climb back in to the ring. We come back from the ads with Beard vs. Mustache happening in the ring. Rhodes and Bryan clash in mid air after they both go for a running crossbody on each other, and Rhodes tags in Big Show. Big Show goes for a chokeslam on Bryan, but Bryan reverses and goes for a missile dropkick, but is caught with a frying pan slap in mid air. Show knocks him out, and Bryan gets counted out. I like the eliminations via count out from Big Show, as he has a last man standing match with Del Rio ar the Rumble, and the ten count eliminations are sending a message. Alberto Del Rio heads into the ring and is caught with a choke slam. Del Rio rolls out of the ring, but gets back inside before the ten count. He falls back out, and Big Show exits the ring to get him. Del Rio fights back and gets in the ring, hitting Show with a few big kicks as he tries to climb over the ropes. Big Show gets counted out (what?) and Rhodes rolls up Del Rio for the win. Just kidding, Del Rio wins after an Enziguiri in the corner. The match was pretty good, but the quickness of some of the eliminations was a little bit jarring. Show’s elimination was pretty stupid too. After the match, Show slides in the ring and hits Del Rio with a spear. He kits the WMD over Del Rio near the announcer’s table, and rolls the table onto Del Rio. We end Smackdown with Big Show counting Del Rio down for the count of ten, something which I can guarantee you won’t happen at Royal Rumble. The Spear should really be Show’s finisher. Not that stupid punch. Well, Smackdown was a great go-home show, furthering every single feud in the WWE. A hell of a lot better than this week’s RAW. Royal Rumble should be great, and I hope you all get a chance to watch it. As usual, you can follow me on Twitter @SmarkInProgress, where I will be live tweeting Sunday’s Royal Rumble.